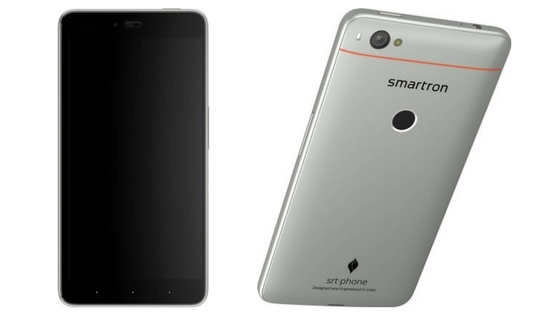 As reported earlier, Smartron has today launched the awaited Smartron srt.phone at an event held in New Delhi. The smartphone is said to have drawn inspiration from Sachin Tendulkar (as suggested by the name based on his initials) and is reportedly a gift for his fans. The device is designed and manufactured in India. It runs on Qualcomm Snapdragon 652 octa-core processor (four cores 1.8 GHz ARM Cortex A72, and the remaining 1.44 GHz ARM Cortex A53), coupled with Adreno 510 GPU. It comes in two variants - 3/32 GB and 4/64 GB RAM/storage combinations. Smartron srt.phone runs on Google's Android 7.1.1 Nougat out of the box. An upgrade to Android 0 (whenever it releases) is promised. The smartphone offers unlimited storage via t.cloud and comes with its proprietary tronX apps. The device sports a 5.5-inch FHD (resolution of 1920x1080 pixels) display with 401 pixels-per-inch and is protected by Corning Gorilla Glass 3. The rear camera on Smartron srt.phone is a f/2.0 13 MP sensor with flash and PDAF. The front features a 5 MP wide-angle lens. The battery capacity is 3,000 mAh. It supports fast charging. The fingerprint sensor sits at the rear. The smartphone is NFC enabled and supports 4G LTE and VoLTE. Dual micro SIM slots are available, along with USB Type-C and a 3.5 mm headphone jack. The back covers on the Smartron srt.phone are swappable. Signature Sachin Tendulkar rear covers are available. The device comes in gray color. It is exclusively available on Flipkart at a price of ₹12,999 ($200 approx.) for the 3/32 GB variant, and ₹13,999 ($220 approx.) for the 4/64 GB model.